There's no maintenance as far as I'm aware. 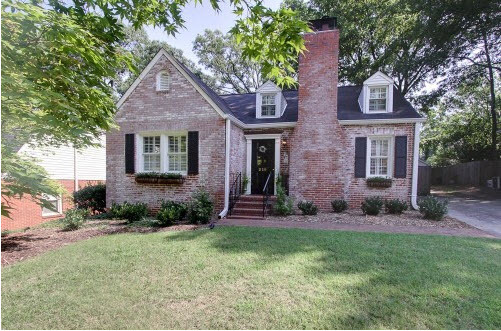 You just let the house slowly fade from white to brick color over time. I used to like that too, and then I moved to an historic district and learned why painting masonry is bad. Paint forms a layer over the brick that traps moisture, and the whole thing promotes faster breakdown of materials. For the era of house you show in the first picture it doesnt really matter because it is not historically significant and it IS cute as a bug as is. But for Victorian age brick and earlier, it is a travesty to paint it. My parents live about 10 mins from a university. My mother works at the university, and my brother gets free tuition. My brother goes to this university. My brother also works about 10 mins from my parents house - sweet deal he can basically go in when he has time and make good money. Here is the crazy part. My brother lived for about 2 school years in an apartment with a bunch of other guys about 10 mins on the other side of the university. Paying for everything - house, food etc. This means that pretty much his entire income from his job was spent on his bills. He has finally "run out of money" and moved back in with my parents. I can only imagine how rich he would be if he had just stayed home, did school and worked. Honestly he could have a down payment for a house by now. I get your brother completely. When I was old enough, I really wanted to move out of the house, as my mother doesn't treat me as an adult, but rather as a child, in my circumstances. At that time, I also used up all the money I earned. At a given time, I also had to move back to my parent's home, I don't remember why. But I moved out again as soon as I could. I lived about 15 minutes from the university I attended. I lived at home, commuted to school, held a job that was just enough to pay for tuition and fees and have a little left over. Living at home, as much as I wanted to move out at the time, just made a lot of sense as room and board would have definitely put me in debt. I knew other students who did the same thing. However, it was interesting how the university put pressure on students to move on campus even on those who lived close to home like me. Some students, like my boyfriend at the time did this. However, I calculated that even if I didn't get out with savings due to rising tuition every year, I could at least get out with no or minimal debt, which would make it easier for me to move out after college. I didn't want to get into debt, so instead I quit fulltime education pretty early on, got a job and continued to study parttime while living away from my parents. In my case, continuing to live with my parents was not an option at all, I come from a complicated family and it just wasn't possible. I didn't get into debt, was able to become a homeowner pretty young and I'm doing a Master's now while working a job. Looking back, I should probably have taken on the loan and continue fulltime education - I would have graduated earlier and would have started making proper money earlier on. On the other hand, I don't regret being debt averse as a young adult. It's a good habit to avoid debt when possible and get used to living a simple life. Many students take on more debt than they really need to pay for tuition etc and spend it on things that aren't necessities. Working and saving also allowed me to buy a house at 24, right before a huge property boom in my country. Buying and renting is extremely expensive now. After about a decade's experience as an adult, I'm confident enough to take on loans for tuition for my Master's, but only because it's a very low interest loan from the government that I only have to pay back when my income is more than a certain amount. I would encourage everyone to move out somewhere between the ages of 18 and 22, except if you need to get into high interest debt to achieve it. I do think living independently is good for you and teaches life skills. It's also a good lesson to know you can live through certain circumstances and end up allright. I know that in the worst case scenario, I can absolutely live on a €100/month grocery budget and still eat relatively healthy, I can live with roommates, I can do my laundry by hand in the bath tub, I can walk to work every day. Of course I want to avoid it happening in the future, but I know I can do it and that's a good thing to know. RE: living on your own vs. at parents: I went to a very big public university that was about 20-25 minutes from my parents' place. I get where the kid was coming from who would have been 10 minutes from school at his parents. Granted you don't go to college just for the "college experience" (well, some do I guess), but I feel that it is really important. Learning to live with others that aren't your family, learning how to have a budget, etc. Parking is an absolute nightmare around the university here, so it is generally stated that you should live on or very close to campus so you can walk, which is what I did. I lived at home my first year of college and then in an off campus apartment after that but I understand the value in living on campus. I study social mobility and education and there are a TON of studies that show for low income and mediocre students in particular, living on campus is correlated with higher grades and more positive outcomes. It is one of the reasons why 4 year universities have much higher graduation rates than community colleges, even when you control for the income level of the students and their families. There is a bit of a peer-pressure effect to study, and when you stay on campus and you are living and socializing with people who are going to classes and doing their homework. When you live off campus you lose that effect, particularly if you are the only one of your friends who is in school. That being said, if you are an outlier you will likely do well regardless (or fail regardless), but for the majority of students there is real value to living on campus, even if it costs more. I think going away to college is great if you can afford it. We had to live at home and my kids had to also. Everyone got degrees. My parents always said they would pay for my undergraduate studies (UK, fees were £2k pa at this time, now £9k). I am thankful in retrospect that I missed my first choice uni by one grade (high entry grade requirements), as if I'd gone there I would have lived at home - an hour by public transport. My second choice was 2 hours by public transport, and so I lived in shared houses off campus (parents paid my rent and bills provided I got the grades). I had a very different experience than I would have had if I'd lived at home, and think I grew up a lot faster because of it. Thank you for sharing. That is really interesting and I had no idea. Now that you explain the positive peer pressure effect it makes sense. Here is another wrinkle to that: The jobs I got that I most needed, the ride-sharing, tool-sharing, and home-sharing solutions that let me save money when I needed to most, all had their origin in the people that I met in college, friends I saw almost every day for four years because we were basically neighbors. My spouse has basically none of those connections because when I graduated and moved closer to my work they (a freshman when I was a senior) moved off campus to the edge of town with me. As a consequence they made many fewer friends period, and almost none of them have kept in touch. I could write a long essay but instead I'll give the cliff notes. Son (young 20's, no debt, savings, paid cash for used car) marries woman with issues but he loves her. His call. He has a strange inability to say no to her and she introduces him to spending. It's like watching someone go from a gateway drug to harder stuff as they buy all kinds of crap including starting a collection of old video games. He's in the service and they have a new child, he's getting out in a few weeks without a solid job lined up, AND THEY BUY A NEW CAR. DIL quote #1: "We bought it now because we know that no one will finance us once we get out of the military in two weeks." Evil Manipulative Mother In Law (EMMIL) had visited for the birth of the child (staying in our home for 3 weeks) and now she begins an intensive campaign of manipulative emotional hostage taking along with outright factual lies to get the young family to move across the country to be closer to her. It works, and they spend a crap ton of money (financed by selling son's paid-for car) to move to where education and job prospect pies-in-the-sky have been promised by EMMIL. More poor financial decisions on housing (a too big house is rented), schooling (GI Bill tuition wasted), training for non-existent job prospects (lies by both PIL), etc. etc. Throughout this debacle we have offered our opinions when asked, sometimes not when asked, and then shut our mouths and watched the train wreck. DIL has consistently ignored us and instead acted on her mother's advice. Young family finally clues in about EMMIL and moves 5 states away, both taking low paying jobs but getting away from the poison. DIL quote #2: "I guess we shouldn't have been taking financial advice from people [her parents] who have been bankrupt four times." They finally start listening to us and opening their financial books. Tons of debt (half student debt brought into the marriage), a monthly cash flow of -$500 and no way to fix that, behind on rent, utilities, etc. They'll be living under an overpass in 6 months. We bail them out enough to bring them home and get them into a living situation. Son gets job and starts looking for a better one. DIL re-passes her state boards and starts working part time. They start listening to us on money. A decision is made to not declare bankruptcy. They work out repayment plans with creditors. Credit cards save one are paid off and they're working on the last one. And, lo & behold, it's DIL who has taken charge of the family finances and is doing all this. There have been a few relapses (a $200 Christmas gift for hubby) but, by and large, she's shopping at thrift stores, clipping coupons, accumulating a small emergency fund, etc. etc. DIL quote #3: "I think in a few years we'll be able to start saving for a down payment." Hey that's a really hopeful turn around! Oh, alienbogey, how refreshing to read about relatives who go from not getting it to getting it! Thank you! "I guess we shouldn't have been taking financial advice from people who have been bankrupt four times"
It seems so obvious to any of us who would even be reading this board, but it's not if you haven't grown up that way. About a year into my marriage, near my wit's end with the financial habits my husband inherited from his family, I screamed at him, "Do you want to end up like your parents or like mine?" To me it was a rhetorical question. To him it was the first time he realized he had a choice. It's also easier for people to accept advice they want to hear and advice that requires so sacrifice on their part. It is nice of you to have bailed them out. I guess you did it to save your son from continuing this trainwreck existence. Normally, bailing out relatives who are bad with money, means throwing money into a black hole. But it looks like your son is trying to make a decent living and improving his life. And even DIL has seen the light. So it was a good investment to help them. I think the key difference here is that before alienbogey bailed them out, DS and DIL showed that they were willing to work to make the necessary changes, i.e. they moved away from the bad influence and were trying to right the ship. Most of the good-money-after-bad stories seem to come from situations where the recipient has shown no desire to improve their situation. Exactly!! Never help people more than they are wiling to help themselves. I don't have words - my 62 year old disabled father with no income besides the trust he lives off of has decided to buy a new car. This wouldn't bother me if he wasn't skipping insulin shots to save money or if he wasn't at risk of having his license pulled because he can't turn his head to see his mirrors. So Gillstone, you're going to report him to the DMV, right? It's not okay to let him keep driving if you know he's a danger to others. Gillstone. Since he's disabled, can you get him into an adaptive therapy clinic for a driving assessment. Something like this one: https://www.chihealth.com/driver-rehabilitation-program That's what we did for my MIL when it was clear her cognitive decline was adversely affecting her driving. In her case, her primary care physician said she had "all" of her over 80 patients go for an assessment to determine what they needed to do to remain safe on the road as they age. It was in a clinic and they do driving simulations, cognitive speed assessments, and a road test. Well, MIL flunked so spectacularly (took 62 seconds to respond to stimula that should take 6 for example) that it was clear to all of us that her driving at all was no longer an option. It was so helpful to have a medical report with a clear rubric that showed that she shouldn't be driving. It sounds like money may be an issue in your case, but honestly that was the best $250 out of pocket (insurance didn't cover it) we ever spent. My SO inherited $1.5m through his late father. His sibling received the same amount, but she is flying through it in a breathtaking fashion. We're talking quitting work for near-constant travel ($40k spent easily, $75k in lost wages), designer handbags ($8k that I've noticed), big game hunting trips ($20k), home renovations ($50k), a boat ($40k), a Range Rover ($80k), plastic surgery, a McMansion -- all in less than two years. Still, the in-laws still find a way to surprise me. Recently, they laughed about forgetting a country club membership fee* for a city in which they no longer lived. They were paying $700/mo for years without noticing it. Mind-blowing that they could chuckle about $18k lost with nothing to show for it. It sounds like I'm joking. I wish I were. * OK, not exactly a country club membership fee but not far off either. Guys, I've found it. The one short sentence that defines the pinnacle of Antimustachianism. This statement, uttered by my sibling, was so profound that it shocked me deeply. Grab yourself a nice hot drink (or something stronger), sit down, get comfy, and prepare yourselves for what you are about to read. I don't think you're ready for this, but here goes. What follows is the most philosophical thing I have ever heard, said in complete earnest with a twang of "well duh, it's pretty obvious" - the very same tone of voice you'd use to correct someone about the fact that 2+2 does indeed equal 4. Okay, ready? "If you earn more money, you can spend more money." No words. I just dropped my jaw and expressed how impressed I was with this gem in the most overboard mocking tone I could muster. I could add no more words to it; I just repeated the phrase back to them, sandwiched between two wow's. I think we've done it, guys. This person has hit the nail on the head so concisely. We can improve no further. And more obvious logic to go with your statement - more stuff purchased means more cost to maintain, update and repair that stuff. Best to keep one's life simple if frugality is important. nonono we don't think that far ahead - it's all about earning the money so you can spend it! more spend is more happiness, right? This reminds me of something that Morgan Housel wrote a while back: "When most people say they want to be a millionaire, what they really mean is 'I want to spend a million dollars,' which is literally the opposite of being a millionaire... A key use of wealth is using it to control your time and providing you with options. Financial assets on a balance sheet offer that. But they come at the direct expense of showing people how much wealth you have with material stuff." This quote blew my mind when I first heard it, and I was already on the MMM train by then. Such a succinct description. I can't handle it anymore; I have to talk about my cousin and his wife. We love them dearly, but it's hard not to compare as they are the same age as us (cousin is 5 months older than me, his wife is a month younger than me, and my DH is a year older than me). She is a preschool teacher and my cousin has some type of office job with some graphic design/marketing classes online (not totally sure, just know he went to community college for ~2 years with no degree at all, then a couple year later took these classes so I'm not sure if he transferred in cc classes and got a 4 year degree or not from this online university). They have mentioned they both have student loans though I don't know the amount. LCOL midwest area. "But ours is much nicer" is their typical line to justify things. About this time last year, they found out they were expecting. During the previous ~6 months to finding out, in which they were semi-trying to start their family, we heard gems such as "We can afford rent so we could afford a mortgage, we just can't afford to save for a down payment; It's stupid to have to save for retirement now, I'd rather have that money and put it down on our student loans and just save a bunch for retirement when I'm 50; If I make an extra few hundred dollar payment to our student loans then I just don't have to pay them for a few months." Also throughout this time - they'd been living together in the same apartment for 5+ years, which was 30%-50% higher in rent than some comparable places (ex: their place 'was much nicer' ie it had 'nicer finishes' which meant dark cabinets/tan laminate counter tops in kitchen and bathrooms, vs all white like a place 3 blocks away that had 200sqft more and was over $300 less per month, but didn't have laundry in unit). Definitely their choice, but I know what DH and I would have done. Spontaneous trip to Europe through one of those Groupon deals - it was such a good deal! New car! Have tried every restaurant in town. Etc etc. Since finding out they were expecting, they decided they needed to buy a house, trying to beat the end of their lease in June. In this area, you can easily buy a cute updated starter home that's 1000-1800sqft for $110k-$140k (you can also get these NOT updated for <$100k - that's what DH and I would have really done). They bought a $200k, 2400sqft home that was poorly flipped and has a strange layout. It's a tri level that had the kitchen and family room on one level, dining room and formal living room on the second, and bedrooms on the next level. At some point the garage was turned into a family room, and the old family room turned into an eat-in kitchen. My cousin's office is now in the old dining room area, but the formal living room is just empty minus stuff stacked in it since they moved. I think they overpaid since it isn't all usable - it was just slightly less than different layouts that size, and substantially more than the places that were 1500-2000sqft. And the flip was really bad - It sold at the beginning on March and was back on the market 3 weeks later for $70k more. And then it stayed on the market until their offer in June - in a market where most properties didn't even make it to their open house that weekend. I've picked up some things from my FIL on this stuff I didn't know before, but there were lots of things that even without that I was like wtf is going on here... Holes in the wall from pictures weren't filled before painting. Baseboard is all effed up. Kitchen cabinets don't line up with soffit. One cabinet couldn't have a door because there is an air duct in the way. Large awkward unnecessary platforms at the bottom of stairs, that are different heights. Super skinny bathroom door for no reason. Spots where flooring changes run at weird angles. Cousin's wife told me when they were debating an offer that she didn't think it was a good deal, her parents didn't think so, but my cousin and aunt thought it was. I visited about a month after they purchased it and was trying to be nice/positive, saying it was nice and would work well for them plus baby, etc. Cousin is all, eh it's okay, it's got all this weird stuff (though it was things that weren't really weird, not anything from my list). Cousin's wife is like it will be okay for 2-3 years before we upgrade. Project list after purchase: Update half bath, add master closet because there wasn't one, fence in back yard, new furniture during Labor Day sales (bc you don't want to open a new credit card after buying a house for 0% financing on the furniture, you want to wait 3 months), new kitchen cabinets because they are gross and new kitchen floor at that time (waiting until Christmas/tax return money comes). Also DIYing most with her parents' help, but not knowing what they are doing or educating themselves on it beforehand. Projects I don't know the cost of: new washer/dryer, new flooring for laundry room, fence in back yard (DIY-looks bad...), opened up wall and put in homemade cabinet (now this was weird, there was a 3ftx7ft space closed in between new family and dining rooms, so they opened it and put the tv there), normal painting of rooms. And then a week ago: We got a new fridge but can't hook it up yet because the outlet is on the side and new fridge is too big to use it, so we have to move the outlet and that's more $$ in drywall/electrical/grumble grumble. Them: Yeah, we still need to buy cabinet hardware. Anyways, here's our new fridge, now it matches! Me: *looks up fridge on Lowe's as that's where most of their shopping has been* ACK THAT FRIDGE IS AT LEAST $2100 ON SALE!!!! So over $7k later on the kitchen, we have a kitchen that has like 1 more cabinet of storage, no more functional than before, no more value added than before IMO, a new fridge even though there was nothing wrong with the old one and it matched already too. And they want to add an island (it's not big enough - they should have done a peninsula, that would work). And they're going to get all of this money back out in 2.5 years when they sell and upgrade. Oh yeah, and because the drywall was cut for the counter there is a big uneven gap all along between the counter and backsplash. And the soffit along the upper cabinets isn't straight but they didn't put the trim back up that hid that. Me to my Dad two years ago: "You're turning 66 and I found a great Social Security strategy for you. For every month you delay it, you won't get $1302 that month but you'd get an extra $13.40 for each future month. You can do this for 1 month or 48 months or anything in between. It's like buying an inflation-adjusted joint life annuity that pays 12%/year. That's much better than what an insurance company would give you. The break-even point is in 8 years and both you and Mom had parents that lived another 20 years at your age." My Dad two years ago: "Huh? What? No, I want money while I'm young and I don't want to dip into my IRA with 1.5% interest." My Dad today: "I scheduled a meeting with my insurance guy. I'm thinking about buying an annuity for the steady income stream. Would a 5% return be good?" I've presented my parents with an automobile insurance plan that will cut their insurance costs nearly in half. They refuse to switch insurers because they have a well established relationship with their current provider. I hope you printed it out on paper to give to them. Unless it is some fly by night insurance company, they should think about it. Years ago our insurance kept going up and up and we never had a car accident or a claim on the house. I called to see 'what they could do' and our insurance agent of many, many years called me back and said NOPE couldn't reduce costs at all. OMG, I was furious! I said screw this and called AARP and after a lengthy process giving them all the information they needed, It turns out we saved something like $880 a year between car/house and umbrella policy plus the policy was enhanced from what we had. So, we immediately switched over. They lost a long time customer and I couldn't be happier! If nothing else, have them call current provider and see if they can match the cost of the insurance plan you found. Anyone ever tried one of those insurance agencies that represent several brands - and then can compare prices for you? Yes, it worked out for me, but then, I knew the owner. These agencies are called "independent insurance agencies" because they are a completely separate business than the insurance carriers. I have to imagine that the agent that Roadrunner53 called was one of the ones that represented only one company (Allstate, State Farm, Farmers, etc. ), because an independent agent would've at least looked at the other carriers they represent to see if they can get you a better deal. You have someone else to do your comparison shopping for you. You have someone else to help you if you have trouble with a claims process. (This happened to me in a theft claim a few years back where the adjuster was totally misunderstanding a clause about electronic equipment. He knew I worked in insurance but wouldn't listen to me that he was wrong, but my agent made some calls and straightened things out. You have a recourse if your claim isn't covered at all, through agent's E&O. Basically, insurance agents carry insurance against their own screw-ups. For dependent agencies, this is pretty much limited to whether or not they got you the coverage selection you needed, but it gets to be much broader for independent agencies because part of their screw-ups can be choosing the wrong carrier for you. For example, let's say that you told your agent you needed coverage for your antique teapot collection. If you were with a dependent agent, they could be blamed if they didn't put that coverage on your policy, but not if the carrier didn't provide it at all. With an independent agency, if they suggest you go with Carrier A without disclosing that they only pay for replacement teapots rather than the full value of the collectibles the way Carrier B would, you could sue them for that omission. My personal insurance is not through the company I work for, because my agent found me an insurance carrier that was willing to insure my car as a "pleasure vehicle" because I drive under 7,500 miles per year and don't use it for commuting. I've had this for 11 years now and even though I get competitive quotes almost every year (both through the agency and on my own), I cannot find anyone who is able to come within 20% of the premium I pay. Some carriers want me to install a tracking device in my car and say that I could get up to a 40% discount, but that's hard to justify because (1) I'd have to pay the increased premium for 6-12 months before being eligible for the discount and (2) there's no guarantee that I'm actually eligible for the 40% discount, because they don't disclose that. Yep. I have used an independent agent for over 20 years now. I ask him to check prices with his roster brands every couple of years, which he does - we've switched several times for lower rates, always with a reputable company, though. I've done independent checks several times, best I could do was match the rates he was getting me. Merula, you are absolutely right: I have to imagine that the agent that Roadrunner53 called was one of the ones that represented only one company (Allstate, State Farm, Farmers, etc. ), because an independent agent would've at least looked at the other carriers they represent to see if they can get you a better deal. It was one of the three companies you mentioned. I also use an insurance broker. A few years ago I called up various companies on my own (I was getting all the ads from my alumni associations for great insurance deals), and no-one had a better insurance deal than the one my broker had already found for me. When DD started driving our broker found the best car insurance for her situation, which was a different company than mine. When my basement flooded I called the broker and they made all the initial arrangements with my insurance company. A good independent broker is great. So my great grandparents were fairly wealthy and managed their money fine. Then they passed the wealthy to my grandparents. Unfortunately they are not good with money. At one point they sold a beautiful piece of jewelry to afford hay for the horses they owned. They also had “advisors” convince them to invest a ton into penny stocks. That ranked and my dad thinks over the years they’ve lost millions of dollars. Problem is they don't have the $800k so option 1. Still pretty stupid in terms of risk. I can also foresee some corruption as the payout the retirement place would make no matter how long they live for. There are probably cheaper options but of course they want “the best”. Sort of, it would be at least a third of not more of their wealth. Honestly I think it’ll be expected that their kids (my mom and her two siblings) to pitch in as well. I’m all about ensuring your parents are taken care of but not at the expense of creating further financial hardship. They should pay for it in full themselves. That would be a "Hell no!" from me. You have $300k? Get a cheap apartment. Have a nice day. Don't blow the rest of your money because we're not going to bail you out simply because you choose to be stupid. Well, if $500k is a third of their wealth, then they have $1.5M, and they can afford the $800k, no? Unless I missed something.